SF Locksmiths are specialists in all types of lock repairs and offer a level of customer service that is second to none within the Doncaster area. Take a look at our genuine customer reviews that show that we always aim to please and don't leave anyone unhappy with the quality of service achieved. All our work is guaranteed for two years and no payment is taken until the job has been completed to your satisfaction and checked over. SF Locksmiths is able to repair all types of locks fitted to uPVC, wood, composite, aluminium and commercial doors. These include multipoint locks fitted to uPVC and composite doors; mortice sashlocks and deadlocks which are usually fitted to wooden doors; and nightlatches fitted on wooden doors as well. We also repair sliding patio doors, specialising in tilt and slide door repairs. If you have been told that you have a door lock that cannot be repaired or replaced, ring us first before considering a new door. We do not fit doors and so we are not going to try to sell you a new door. All our repairs and replacement locks come with a two year guarantee, the only locksmith company in South Yorkshire to do so. 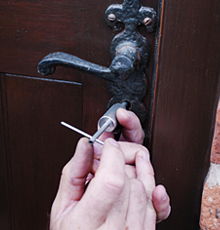 SF Locksmiths also specialise in the repair of window lock mechanism's, hinges and handles. Often a repair to a window can be seen as a "little job" that no one will want to do. We do not see it like that at SF Locksmiths, with a replacement window costing hundreds of pounds and an inconvenience as well, our aim is to fix your window problem quickly and professionally. We have over 20 years experience of repairing door and window locks. We are confident that we will resolve your lock problem with little fuss and that you will be completely satisfied with the approach we offer.